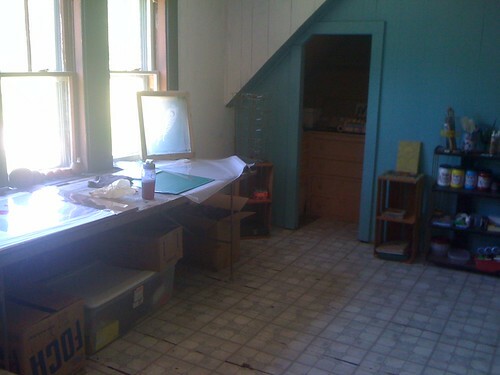 We picked a big room upstairs from the kitchen to be my studio. It’s got six beautiful windows and lots of open space. On the negative side, the floor is in bad shape, it’s got damaged old wood planks with a few big gaps where you can see through to the kitchen below, all covered over by vinyl flooring which is peeling and curling and torn away in a few spots, then covered in some places with a second layer of peeling and curling vinyl, it’s hideous. 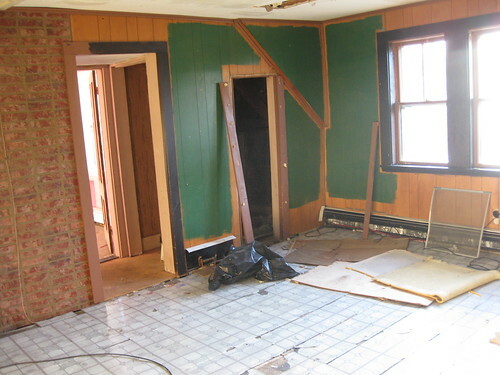 And the walls are covered with seventies-style fake wood paneling which someone partially painted forest green and then gave up and just punched a few holes through the wall instead of finishing the paint job. They even painted over a few random sections of the cruddy brown trim with what looks like black nail polish. I don’t need my studio to be very fancy at all, it’s just a place for making messes anyway, and we’re supposed to be focusing our renovation efforts on the kitchen and bathroom downstairs, so the studio is like the last priority for real renovations. But the ugly splotches of green paint were going to drive me crazy, so I decided to do a quick and dirty paint job just to give the place a little bit fresher look. first order of business: cover up those crazy patches of green paint. I can’t possibly concentrate on work if I have to look at that crazy paint job all day. I even primed everything and then painted it all some historic shade of greenish-blue. 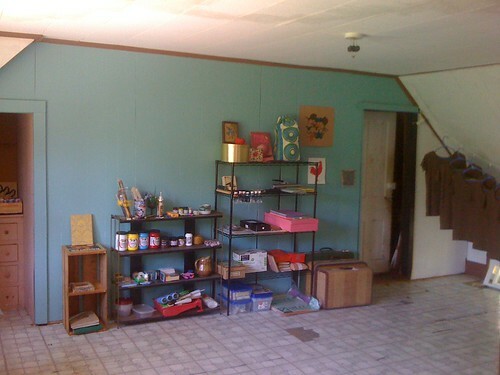 (I will admit that I have a strong urge to paint EVERYTHING in the whole house greenish-blue or bluish-green or robins-egg blue or dusty aqua or anything along those lines. I am going to have to use a lot of self control to avoid making the whole house look like a swimming pool.) Anyway, I haven’t totally finished painting but it’s looking a lot better already. I was in a rush to get working so I could print up a bunch of t-shirts and new cards for the Renegade Craft Fair, so I had to start filling up the studio and working in it even before the painting was done. I swear I am going to finish the paint job soon! 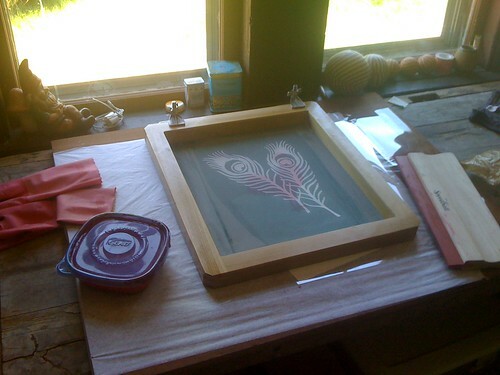 silkscreen set up! My first screen made using my new light table! I found some small shelves for free on craigslist, and got some more cheap sturdy shelves at a big box store (ugh). Shelving is the one thing I can never find used at the salvation army or on craigslist. My parents gave me a beautiful, incredibly heavy, big long work table (I think maybe an old army mess table?) which they’d in their basement for eons. The table-top is too rough to print on directly, so I made a portable printing station with a smooth, flat slab of wood and silkscreening hinges. I covered the wood with a layer of clear acetate so it’ll be easier to keep the surface clean. For drawing at my worktable, I found a super comfy giant office chair by the side of the road in Limington. For drying printed t-shirts, I strung a clothesline across the back of the studio and tied little loops for hanging clothes hangers at regular intervals. For drying printed cards, I found a beautiful folding drying rack by the side of the street in White Rock, what luck! (I have a sharp eye for free stuff, right?) The biggest studio project was the light box which I need for exposing photo-sensitive emulsion to create my silkscreen stencils. It’s just two long fluorescent shop-light fixtures inside of a big box, on legs, with a thick sturdy glass tabletop. I built one a few years ago when I was setting up my first studio in New York, and it took me a few days in the workshop with my dad’s help. But this time I whipped it up in just one day, in my dad’s workshop, with just a little help from Mike to screw in the light fixtures that evening. And it works! 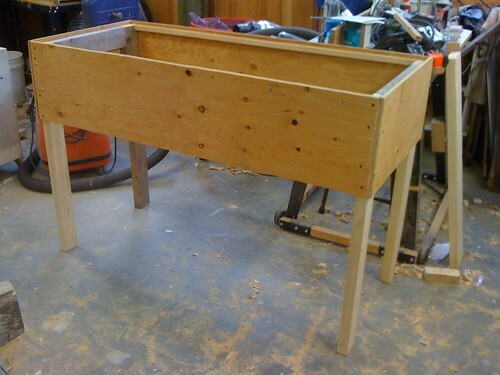 building my new light table (in Richard’s workshop) … and the finished product! At the moment I’m using the icky, windowless downstairs bathroom as my darkroom though I would like to eventually build a little darkroom in the closet attached to my studio, I just need to do some major clean-up in there, and hang a door. And I’m using the garden hose for all my washing-up needs, but one day soon we will get running water and plumbing in the studio! I found a utility sink in the back yard at limington (perfect! ), and my parents have been trying to get us to take this old claw-foot tub that’s been sitting in their back yard in Gorham for thirty or forty years at least. 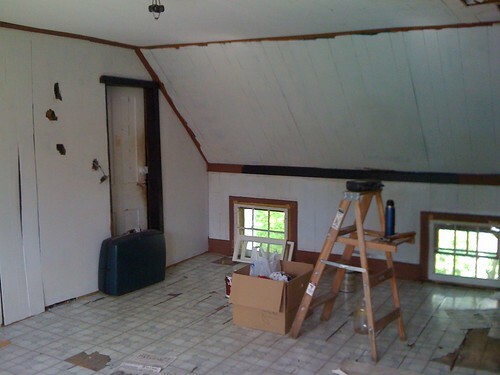 I think the tub and sink will go side-by-side on the back wall of the studio, by the chimney. I can use the sink for cleaning up small stuff like paintbrushes, and the tub will be excellent for washing out big screens. And gorgeous too. I am going to have such a great wash-up station! The studio’s definitely not finished but it is really exciting to have ONE room in the house that is actually functional. I spent a lot of hours in there during the past few weeks, working late into the night. It’s a great space already.